Processor Expert in MCU10 generates a lot of files for me. But sometimes I need to tweak things a bit. I change the generated sources to fit my needs, and then I want to prevent that my changes get overwritten by the next code generation. First, I need to know which files are generated: the information in “Dissection of MCU10 Projects” helps me to identify them. But how can I prevent code generation for each component? Or for other generated files? Or how to completely disable code generation? 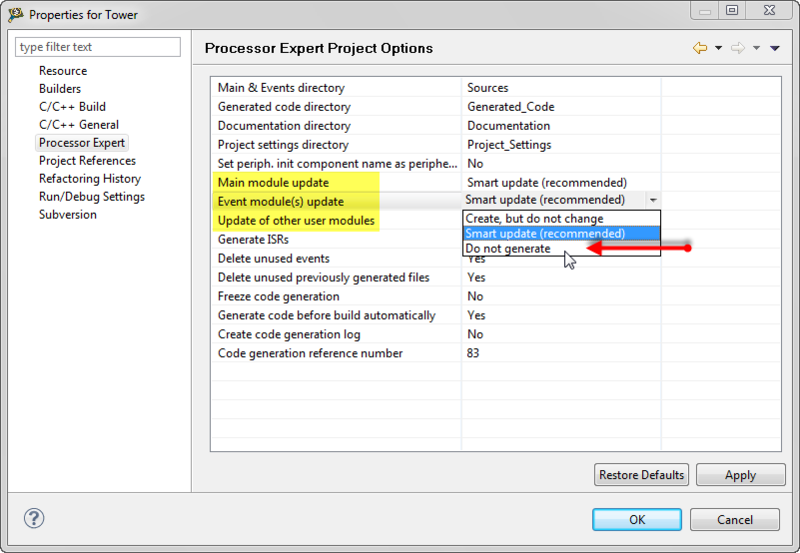 That way I can prevent creation of the shared module completely with the ‘Do not generate’ setting. Or having code created, but not changed afterwards with the ‘Create, but do not change’ setting. 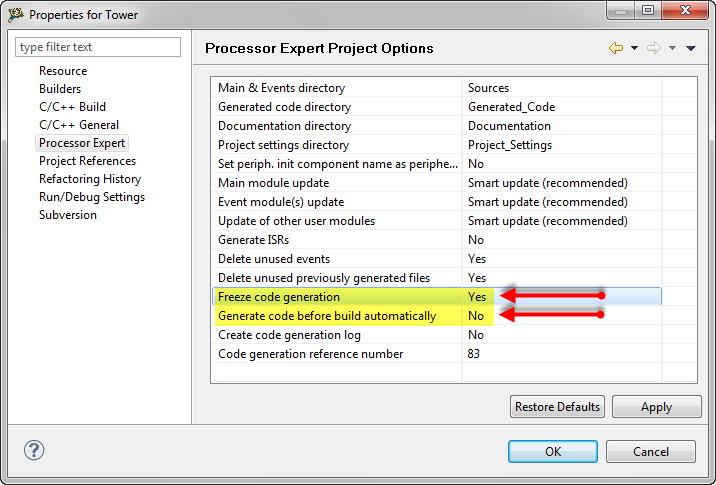 The same dialog gives me control over the build process: If I want to disable code generation when I do a build, I can control this with the ‘Generate code before build automatically‘ setting. With this I have complete control over my code generation. This entry was posted in Processor Expert, Tips & Tricks and tagged CodeWarrior, Eclipse, Embedded Component, Processor Expert, Tips&Tricks by Erich Styger. Bookmark the permalink. It seems that “For Each Component” section is not working for some cases. These are cases where the component contains files not meeting the normal assortment of .c and .h files with the expected name. This should be addressed on CW10.3. In the meantime, some use of the “freeze code generation” may be needed, more so than would otherwise be expected. I cannot reproduce this, at least with my components. E.g. my RTOS component creates other files than *.c and *.h, and suspending code generation for it works. So it might be indeed related to a special component you are using. All what I can say is that the setting should inhibit code generation. If not, then this sounds like a bug. I propose that you submit the details to support/CW team? I assume this means that you then add your customized generated code files into version control. Is that true? yes. If you change the generated code, then definitely you have to put it under version control. And I know that some users put the whole generated code under version control, regardless if modified or not. That makes sometimes sense, especially if you want to track the differences in the code generation. I’m not doing it during the development cycle. But I put everything (including the object files/etc) into a (different) repository once I have finished the project. Just to capture everything else. Thanks for the advice Erich! BTW, you don’t happen to know if there’s a way to make PE generate the code from the command line do you – something I could stick in a batch file? It does not seem like there is – but I thought I’d ask since you’ve clearly had a lot of experience with the Freescale tools. I have not done it, but I know it is possible to run the IDE from a batch file and to perform some actions, and one if it is to build a project. As part of the build/make it would generate the code. I’m not aware of a special command just to trigger the code generation. But if you would delete the Generated_Code folder, the code generation process should be kicked off. I’ll browse around if I can find something else. Well, I just tried it out using ecd.exe and found that PE code generation does *not* happen as part of an ecd.exe run. Once I generate the PE code in the IDE, I’m able to build the rest of the project using ecd.exe, but that manual step is indeed required first. I guess I’ll just have to check in all the files that PE generates. if i want processor expert to not generate code for certain lines in a file, is there any defined macro that can do that? i want to test freertos version 8, and i need to add pendsvhandler and systick handler to vectors.c, but without rtos component, it will reset the vector table everytime. 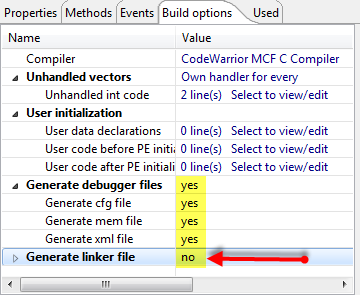 In MCU10.5, you can disable code generation for the CPU component. With this disabled, then I think the vector table remains untouched. I planned to look at V8.0 of FreeRTOS over the next weekend if time permits. If you could kindly help me by sending or sharing from where I can get these components then it would be a great help.